Today i fished with Robert and Maria Eagly from Gadsden Alabama. Our weather was perfect after the two days of very strong winds and the Eagly’s were ready to catch some fish. Our trip began at 5 pm with a short ride to find a few Dolphin. In just a few minutes we had located the Dolphin and Maria was snapping some cool pictures. This fishing trip would be the first Inshore saltwater experience for either angler and after about 30 minutes with the picture taking we were off to find them some fish. 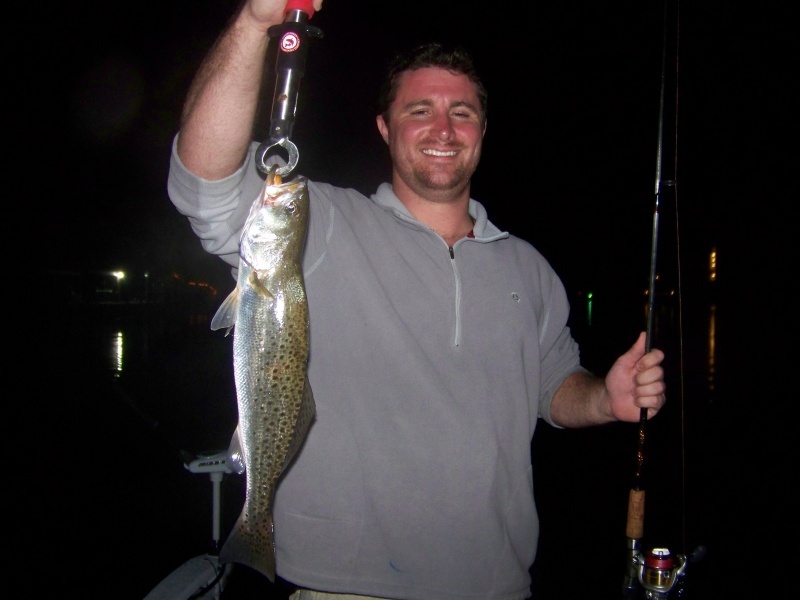 It didn’t take long and Robert had two Speckled Trout at the boat for the couple to admire. Not to be out done Maria soon had her own two Trout at the boat. Back and forth most of the night these two were catching Speckled Trout, White Trout, Ladyfish and Redfish. They stayed neck and neck till the very end complimenting each other with every catch. 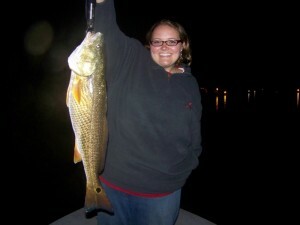 As we headed back towards the boat ramp we hit one last spot and Maria showed Mr. Redfish a Gadsden Girl trick or two. With a perfect hook set i watched as she fought a Redfish that ended up just shy of 27″. Walking around the boat and from front to back she fought this fish like a pro. After landing the fish and everyone sharing high fives it was Roberts turn. Casting back to the same spot his line is quickly hammered and the fight is on again. This time up pops a nice Speckled Trout. After a few more cast and a couple more fish we called it a night. I think i had as much fun as the Eagly’s did, they were a pleasure to fish with and i probably learned as much about Facebook from Maria as they did about fishing from me. It was a great night on the water and i look forward to fishing with both of these anglers again in the future.